We’ve added a great deal of new features and functionality to the 2018 versions of the Emulate 3D products, so whichever license you use, there is something for you in the new release. CAD is The Model takes top slot, but we’ve made workflow improvements and added features to make your job easier whether you are working with Emulate3D controls testing, simulation, or demonstration products. And remember – Emulate3D and Sim3D also contain the features in Demo3D, and Demo3D includes everything in Layout3D. If you are lucky enough to have an Ultimate license, you have it all. CAD Is The Model is a new set of features to allow your CAD to be marked up with “Aspects” to create Dynamic Digital Twins for virtual commissioning, simulation or demonstration models. These Aspects represent things like conveyors, joints, physics geometry, sensors, etc. This is a new approach to turning CAD into usable emulation and simulation models of machines or layouts as efficiently as possible. The default Aspects are Controls Testing ready, so you can generate PLC Tag IO points directly from Aspects with no change to the original CAD hierarchy and no need to add extra Visuals overlaid by CAD. The workflow allows the CAD to be modified and updated while retaining all the existing Aspects, allowing continuous iteration of both the CAD machine designs and the PLC code that controls them. A new catalog has been created which holds a default set of Aspects and a Plugin which gets added to the User Interface when the catalog is loaded. User-defined Aspects can easily be added using custom C# scripts in the same way that existing scripts are written. What Else is New for Emulate3D Controls Testing Users? 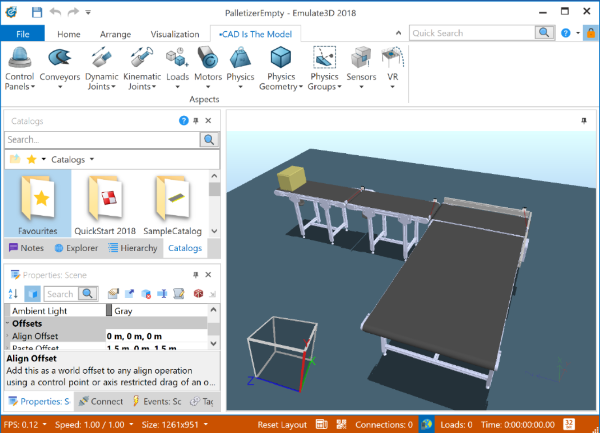 The new CAD is the Model technology enables you to create ECT-ready catalog items by importing your CAD and marking it up with just the properties you need, including IO tags. But we’ve also added support for OPC UA, the Simatic Manager/TIA Symbol Table, S7Online, PLCSIM Advanced V2.0, Rockwell OTS, User Defined Data Types, Extended Addresses, and additional protocols for the Net Server. We’ve improved the Pulse Encoder and Gray Code handling, Tag Configuration and Tag Groups, and added support for TwinCAT PROFIBUS/ PROFINET Configuration Subslots, as well as adding Wiring Diagram Emulation. What’s New for Sim3D Users? • Other improvements have been made to areas including path building, Dual LHD AGVs, TrackSwitches, Zone Management and more. In addition to the Vehicle Framework, an Event List Window has been added to assist with diagnosing logic issues. This lists every event, the time it occurred, and the Visuals involved such as loads, conveyors, vehicles, etc. You can stop your model at a specific time, log events to a file, see the list of future scheduled events, and select one as a stop event. You can track the evolution of Visual properties via the Event List Window in order to assist your logic testing. We’ve added Simulation Step Control to enable you to advance the model in milliseconds, seconds, or by stepping from event to event, Physics Step, or Render Event. Custom Properties which generate pseudo-random numbers now have a new Distribution Editor which displays how parameters control the distribution profile. What’s New for Demo3D Users? The CAD is The Model toolbar is added to all editor versions of Emulate3D products, and enables you to mark up your CAD with just the properties you need to make it operate, with no extra overhead. A VisualAspect is a component that can be added to any Visual. It’s like a combination of custom properties and C# scripts, but unlike C# Scripts, multiple aspects can be added to a single visual. A VisualAspect is defined using a C# class that derives from the Demo3D class VisualAspect. It has methods that can be overridden to perform certain functions at different points in its lifetime and it can call out to all existing C# APIs for manipulating Visuals, the Document and the App. There is a new Aspect Viewer window available which can be used to edit visual aspects in a more advanced way, as well as, in some cases, enable or disable them dynamically. Aspect properties can also be accessed through the Property Grid. Kinematic mechanisms can be constructed from several different joint types and can operate in one of three modes: forward kinematic, inverse kinematic, and passive. Forward kinematic parameters can be set directly by the user or driven by a motor. Inverse kinematic parameters are solved efficiently to satisfy loop closure and any user-specified goals or interactions. Passive parameters provide a method for simulating complex or hidden mechanical couplings, such as gears. Kinematic mechanisms do not suffer from physics jitter or instability. Non-contact based interactions between links mean that fast moving objects do not suffer tunneling or large de-penetration forces, leaving you confident in the results. Loop closure and goal constraints can be solved down to an extremely small user-specified tolerance, yielding realistic and precise movements in real-time simulations. We’ve also added Convex Extrusion Physics Geometry for more accurate guide rails on machines and transfer mechanisms, and there are new Source Control Enhancements. Last but not least we’ve added C# 7.2 Scripting Support, enabling power users to benefit from the new C# Roslyn compiler and associated toolchain. What’s New for Layout3D Users? tree. This information is used by the new Update CAD button which re-imports the original CAD files but preserves any changes that were made that aren’t related to the CAD, such as additional child visuals or Visual Aspects that were added. This allows CAD to be upgraded in-place within an existing model. There is a new View Cube which makes it considerably easier to position the model. To be able to extract a Visual or a selection of Visuals from a scene the ability to invert the current selection and select everything that is visible, but not currently selected, has been added (Invert Selection). You’ll find Plan View Rulers to help with alignment and dimensions while in plan view, where rulers now appear on the top and side of the view that show the distance between two points. The Align To/Select dropdowns have been replaced with a Snap Mode dropdown, and the floor which can now be aligned to from any existing feature. The Dimension Tool has been updated to make it easier to use. Dimensions can be placed by either selecting a single edge of a Visual, or by selecting two different points on the same or different Visuals (including the floor). Once the bounds of the dimensions have been selected, the position of the dimension text can be changed by moving the mouse. The Static Analyzer has been added to help users determine which Visual can be made static. This helps to improve runtime performance, particularly for models viewed in a VR environment. The default lighting in VR can now be overridden to use custom lighting from inside Demo3D. These lights can be configured individually and set to cast shadows. Point Clouds are now also hugely improved in VR. The CAD Is The Model Add-Ins for CAD packages such as SOLIDWORKS use the Web Server feature in Demo3D to connect to an existing Demo3D session and insert or update the CAD in the currently loaded model. To make it easier to enable the web server we’ve added a new shortcut button on the bottom status bar of the main window. When the web server is enabled (or connections have been made) the status bar will turn orange with the Web Server button highlighted in blue. A new option for printing to scale is available for in the print/plot view for the scene. • Define racks with mixed shelf types and tunnels. • Use QuickLogic procedures to build complex rack arrangements. • Implement custom addressing, prioritization and zoning. • Includes an internal SRM and Rack Populator. 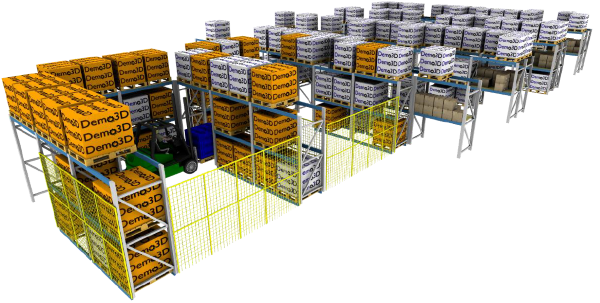 • Generate reports for the racking system. Windows Mixed Reality Headsets. The advantages of demonstrating prototypes of complex semi-automatic machines and training operators safely with interactive virtual reality systems have really become clear to users over the last year. As a result, support has been added for the range of Windows Mixed Reality Headsets, and the associated controllers, made by companies such as Dell, Samsung, ASUS, Acer, and HP. These Virtual Reality headsets have the benefit of using the spatial tracking software from the Microsoft HoloLens, meaning there are no external lighthouses or sensors needed (as is the case with the HTC Vive and the Oculus Rift). The Demo3D Windows Store App now has support for Microsoft’s Holographic Remoting Player App for the HoloLens. This allows the HoloLens graphics to be rendered on a remote PC and streamed to the HoloLens via Wi-Fi. The remote PC can use high-end graphics cards to render larger scenes with more detail than the standalone HoloLens is capable of.